Too much or too little data too. Manual processes. Inconsistent reporting & bad formatting. Ugh! In order to secure, retain and grow client relationships, marketing agencies need to build a repeatable process for reporting results. Very few agencies would argue with that statement. And most will tell you they have one. But, on countless calls with agency owners and agency account managers, I’ve discovered very few have a process they’re proud to share. Many agencies run reports for clients only after being asked or only at renewal time. Some do it for some clients and not for others. Quite a few agencies have different processes depending on who is running the reports. Here’s the most common and obvious mistakes I’ve seen and how they lead to lost clients. The biggest mistake agencies make that sabotage client relationships is not consistently doing reporting for every client. Clients need to be reminded what you’re doing, how it’s working and why you’re doing it. When I started delivering online marketing services in the late 90s, there weren’t easy ways to prove a ROI: it wasn’t easy to show clients how campaigns and tactics produced new sales opportunities. If clients weren’t able to turn inquiries into sales or didn’t want to tell us about it when they did, we had little ability to convince them to continue employing us. So, unfortunately, we were not only reliant on the client measuring the impact, but also dependent on the client being honest with us. But, today, it’s easier than ever to track buyers from their first interaction with a company’s website to the last touch before they buy, and everything in between. Most companies today use marketing automation platforms like HubSpot, analytics tools like Google Analytics, ecommerce services like Shopify or a customer relationship management system like Salesforce to track and analyze what marketing channels and marketing activities produce revenue. Bottomline: justifying a continued investment in online marketing is easy now. Unfortunately, many marketing agencies are still relying on anecdotal evidence willingly shared by clients to prove their worth. Instead, agencies should proactively prove their worth to clients through their reporting process. They must have a repeatable reporting system that allows them to set and revise goals with clients, track progress against those goals, proactively review results with clients and propose new ways to help clients achieve their goals. Me: This is an impressive process. Most agencies are not this regimented and thorough. Me: But, how much time does it take to do the cutting and pasting? Owner: Only about 90 minutes per client. Me: And how much time does it take to set up a new one of these reports for a new client? Owner: We’ve done it a bunch of times now. So, only about 3 hours now. Me: Since you’re only doing this monthly, how do you keep track of ad campaigns and content performance in between reports? Owner: We login to different systems on a pretty regular basis to monitor performance. Me: Given that I’ve shown you how Databox can automate most of this process and can reduce hours down to minutes, why aren’t you eager to switch your process over? Owner: [Big pause] That’s a really, good question. I hadn’t really thought about the amount of time we spend until now. This agency owner was so proud of his process (as he should be), he didn’t realize he was spending 10s of hours every month doing work that is easily automated. When I’m speaking with agencies about their reporting process, I often ask them to send me an example of a report. Most agencies send me their best report. It’s usually a pdf or powerpoint document with consistently formatted graphs, a table of contents and headers and well written paragraphs with insightful take-aways and recommendations. But, the other day, one agency sent me a link to a document that showed kindergarten-level workmanship. They had simply cut and pasted graphs from different tools into a Word document. Not only was every graph formatted differently, there was no interpretation of data. This agency had stopped producing attractive reports because “clients weren’t reading them.” So, they switched to quick and dirty reporting so they could spend time on live analysis and review. While I applaud their focus on analysis and appreciate their ability to interpret data and make recommendations on the fly, it’s hard to effectively communicate recommendations without some effort into formatting. Plus, as an agency, the appearance of your work is paramount. It’s a reflection of the quality of work you do. You certainly wouldn’t press publish on a poorly formatted website or email campaign. Don’t publish poorly formatted reports either. Instead of skipping the formatting, do it once and forget. Create attractive templates with your or your client’s branding and never think about formatting again. “With so much data available these days, business leaders often try to consume everything. But, not every metrics is as important as the next.” wrote Stephen Barone, COO of Full Funnel, a sales and marketing outsourcing and advisory firm. Agencies are notorious for getting into the weeds. As marketers, agencies love talking about marketing tactics. And that’s fine when talking with peers. But, when agencies are selling or servicing non-marketing executives or business owners, it’s important to stay focused on business goals. For most agencies, the most important metric to report is ‘revenue generated’ and the budget it took to produce it. One exception: if they can’t yet track how their work is impacting revenue or calculate ROI yet, reporting on traffic and lead growth is an ok proxy. The metrics that directly impact the sales funnel from visitors to revenue and every step in between. 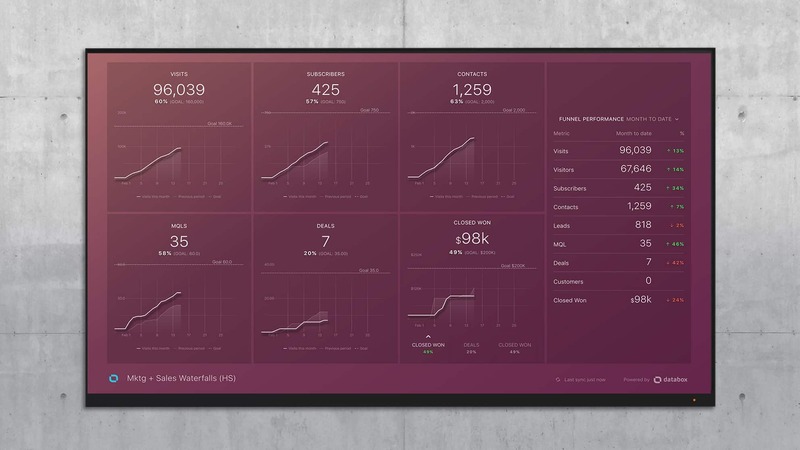 As an example, this dashboard is for a company that needs to feed leads to their sales team. It includes visits, subscribers to their blog, new contacts or leads generated, marketing qualified leads, sales opportunities or deals and revenue booked. How the marketing is performing versus the previous month. How the marketing is performing against goals they’ve set. Don’t get me wrong — monitoring low level metrics is critical to improving results. If you’re not reviewing all your stats in near real-time, there’s no way to know what’s working and what’s not. It’s the equivalent of “flying an airplane blind”. Just don’t lead off your client reports or presentations with lower level metrics and don’t try to explain everything to every client. Some clients will ask for more data than the high level stuff. They might want to drill into the details to see what’s working and what’s not. Don’t be afraid to provide this data to them. It never hurts to have another set of eyes on data. To be prepared, make sure you’re monitoring data about all of the marketing activities you’re performing for each client. Stream Creative, a Platinum level HubSpot partner recently shared the marketing dashboards they use to monitor how social media and blog posts are performing, whether their landing page strategy is producing quality leads, as well as search rankings and social follower demographics. By monitoring all data from all clients in near real-time, agencies like ClearPivot and Stream Creative are able to adapt ad campaigns and content plans as they run them. By adapting these campaigns frequently, they can improve results as they execute them. This is why monitoring low-level stats is important, even if you don’t present them to clients. Google Analyics, Adwords, Facebook Ads, Facebook and Linkedin Company Pages, HubSpot, Wistia, Drift — the list goes on. With so many sources of marketing data these days, monitoring and reporting results is more difficult and time-consuming than ever. But, it’s also just as critical as it’s ever been. 73.5% of CMOs surveyed by RSW/US said data/analytics capabilities are important or highly important. 30.1% said it would be “a leading determinant of agency selection/retention,” while 40.4% said it would be one of several key factors. Source: RSW/US via HubSpot. Download full RSW/US report here. Fortunately for agencies, technology makes it easy to automate the repetitive, error-prone, mind-numbing and low-value tasks of pulling data into one spot and plotting consistently-formatted results versus historical performance and goals. Report automation allows agencies to redirect energy towards extracting insights and formulating recommendations. If your agency is serious about improving retention, stop cutting and pasting numbers into spreadsheets and redirect that time towards actually improving the numbers.